Seventh Generation is a brand that I know is good to use in my home. I love knowing that using their products, I am not bringing and using those unwanted chemicals in my home. One thing I know that is something that parents think about is, what they use around their babies and what will be touching their skin. Babies skin is so soft and delicate and everything that touches their skin can affect them. My kids have sensitive skin, just like me, and one thing that I have always thought about is the chemicals that can come in contact with their skin. No parent wants their little one to get a rash because of the diapers they use. So why not use a diaper that is made by a company that strives to make the best products for your entire family. From the cleaners and detergents to the diapers that are safe to use against your babies skin! 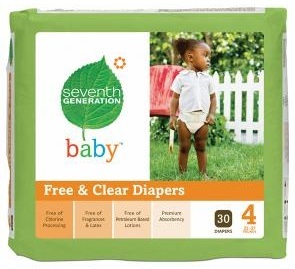 I was sent a pack of the Seventh Generation Free & Clear Diapers to review. I love that not only are these diapers safe to use on your baby, but they are also absorbent. What Seventh Generation leaves out is just as important as what they put in. Free & Clear diapers do not include chlorine processing, fragrances, latex and petroleum based lotions. In an effort to contribute less overall landfill waste and continue to ensure a premium standard of absorbency, the new Free & Clear diapers have been redesigned with a lighter-weight core. With processed chlorine-free wood pulp in Free & Clear diapers, Seventh Generation also makes certain that no chlorine is released into the environment during the totally chlorine-free (TCF) whitening process of the diapers and training pants. Seventh Generation has also reduced the size of the diapers’ plastic packaging, meaning that each pack now contributes even less overall landfill waste than before. In fact, Seventh Generation Free & Clear diaper packaging can now be recycled at local supermarkets where plastic bag recycling collection boxes are available. I will be giving one of my amazing readers a pack of their own Seventh Generation Free & Clear Diapers in either a size 2,4 or 5!! Tell me what you think about the new Free & Clear Diapers, please leave me your email with this entry! This giveaway is open to US and residents. This giveaway will end at 11:59 pm on October 5,2011. Winner will be chosen at random.org and will be given 48 hours before another winner will be chosen. All products for reviews and giveaways are given as a sample from the companies. All opinions in reviews I conduct are my own. I was not paid to say anything or review any products. Previous Post Pillsbury #Giveaway CLOSED!! i like that they are free of colors and chemicals. i like that they are chlorine free, would love to win a bag for my 1 yr old! i entered your babyganics giveaway! i entered the play doh giveaway!